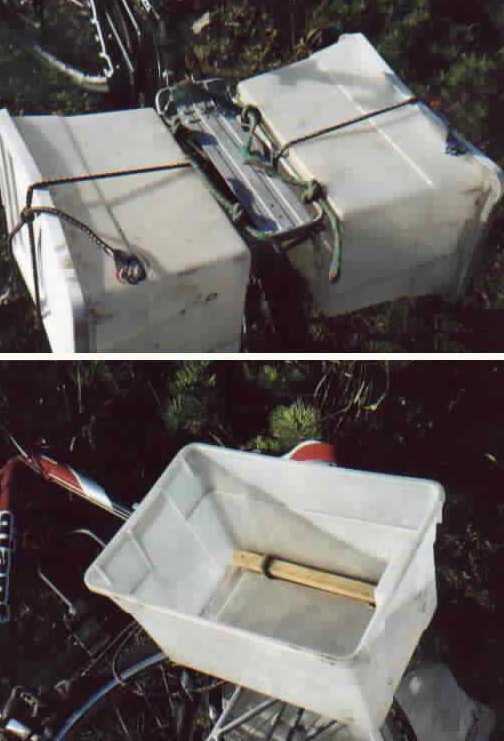 As of 2012, I no longer use my own home made panniers. There is now a good store bought version at a reasonable price. Ortlieb Panniers made in Germany. Before, I couldn't find any panniers on the market at a reasonable price so I made my own, but now these panniers are so good and fairly inexpensive that I no longer make my own. Commercial pannier design is improving over the years. Like a waterproof bag that clips to the rack. Bag can be folded down. 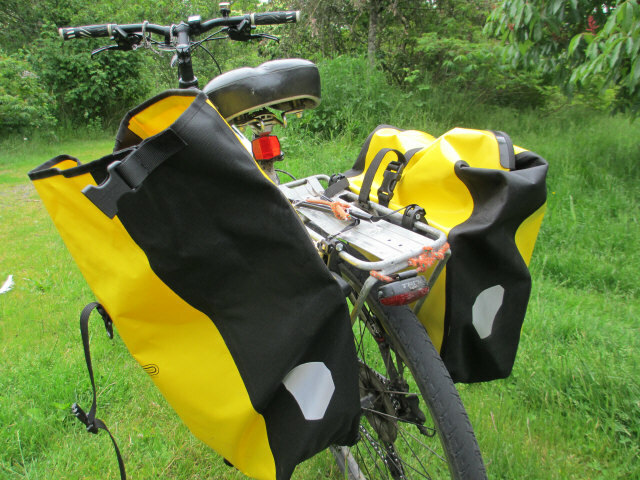 For historical use, see below a set of panniers I made before discovering the Ortlieb Panniers. Some people put files in them to shove under the bed. Two plastic boxes, like one can buy cheap at a variety store. For each box, cut two holes in the bottom near one of the long sides. Then place a wood rod inside next to the two holes. This distributes stress from the next step. Used on my 2006 trip. Run short stubby lengths of bungy cord through the holes. Tie around wood rod and side bar of back bicycle rack. Panniers hang sideways from both sides of rack. Rods that attaches bike rack to back wheel dropouts keep boxes from sagging into wheel. Place lids over tops of boxes that point sideways. Tie another bungy cord around entire box to hold lid on. Put your stuff into bags that fit inside boxes. It looks sloppy, but works great; at least for me. ---True story. Tent, sleeping bag and other bulky items can lay across the top held on with, you guessed it. More bungy cords. 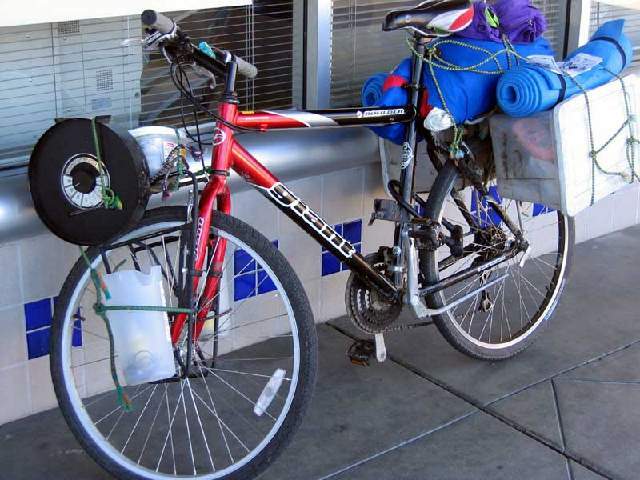 My bike in 2004 as passing through Palo Alto, CA. Tupperware Panniers and dish style AM radio antenna booster on front. Bike touring questions and answers.